On Tuesday, after what has become our regular Tuesday evening hang out, I invited Cassie and Andrew over to have wine with me. It had been about a month since I last had any wine due to a very busy schedule since the end of the academic year at my University. The nu mber of summer projects has been astonishing and every passing day makes me long for September when the students will have returned and things will slow down - but I am not really complaining, I love what I do and where I work. So as much as I have wanted to have a glass or two of wine, I have often been too tired at the end of the day. I know, I know, "too tired for wine?!?!" but I digress. Andrew and Cassie came by and after going through my now half-way decent stock of wine (not only have I not been drinking wine, but I also have not been procuring wine! ), Andrew decided that I should open a bottle from Domaine Drouhin. 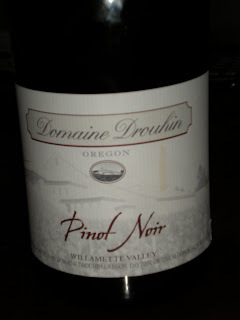 The wine selected was a 2006 Pinot Noir from their Willamette Valley label. I have been holding onto this bottle for about 4 months. I won it as part of a charity event that one of the student groups was sponsoring. I had done my research and knew that there would be high expectations for this bottle of wine - and clearly Andrew did as well because he was a bit more anxious than I was to open it. Cassie is not as well versed in wine, so Andrew and I had to muster enough excitement for the three of us - not too difficult a task. I didn't want to be rude and type this while I was entertaining, so I pulled out my "a wine lover's journal" and tried to make notes while still paying attention to my guests. I have to admit that we didn't really let this bottle breathe much. Between it being a bit late and looking forward to drinking this pinot, we may not have done it justice by letting it aerate. I say that because the nose on this wine was strong initially but I don't know I would call it "full-bodied." We sniffed it and although taking long breaths, we only initially got the "heavy" aromas that pinots have - the spices and oak barrel. 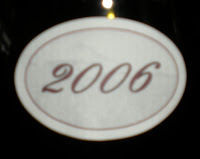 It is also completely possible that that is the way this wine was developed. The legs were also amazing - nice and even with a good coating on the glass. The palate was so incredibly enjoyable. Upon tasting it, Andrew's response, "That's how a good pinot noir tastes!" made us all laugh a little bit. I have used "crisp" and "clean" to describe wines before, and I won't want to take away from those wines or this one either, but it would use those adjectives and "smooth and delicious." The hue dynamics of this wine is definitely worth noting. I was standing up when I poure d our glasses each time, and looking down on the glasses, the hue is a beautiful light red-grape color. Not a deep grape like grape juice, but almost like apple juice of a light red coloring. My seat was next to a lamp in my apartment and when I swirled my glass and held it up to the light, I was taken aback that while looking at my glass from the side, the color was a very deep non-transparent red. I wasn't sure if it was just me so I asked Andrew if he noticed that as well, and he confirmed. I can honestly say, I do not recall having that experience with a Pinot Noir before, but it could be that I have not been that observant in my previous consumptions of red wines. Either way, major league kudos to Domaine Drouhin on the hue. This was an amazing bottle of wine, I only wished I had another in stock. Drinking this wine reminded me how much I missed drinking wine. I know I need to be more intentional about making time to enjoy something that brings me pleasure, within reason of course! And although a little bit on the more "pricey" side of wines, I would definitely recommend it.